I was about to post a bean stew recipe tonight. But as we are sitting here in Dubai, with sand storms blowing for the third day in a row, I rather share my Arabian Nights Cookies with you. That gives me a chance to bleat about living in the desert. Sandstorms come here about five times a year, sometimes just for one day. This time it is has been going on for three days. Finest sand and dust gets picked up over the desert and gets carried here by pretty strong winds. It's no pleasure to go outside, and you just want to keep all windows and doors as shut as possible. This fine dust finds its way through the tiniest holes anyway. Fine layers of it settle even days after the sandstorm is over. Inside my house on my furniture that is. I am not too fussy when it comes to untidiness ( I have two small kids and got used to it gradually), but this dust everywhere just drives me mad. In fact, it is futile to start cleaning yet, as it will take a few more days before it is finally over. As if my intuition knew about it, I baked these Arabian Nights Cookies a couple of days ago - spiced with orange zest, cardamom, cloves and cinnamon and a topping made of sesame seeds, pistachios and candied orange peel and saffron. They are sweetened with honey. ...... I just had half a dozen of these little cookies and what happened? It started to rain!!!!! Yippiiieeee! I am not sure if anyone who has never lived in Dubai, knows what I am talking about here. FYI, it only rains about 5 to 10 days each year and only in winter. This year's winter has been especially dry. So having a little rain (or if not that, just an overcast day will do) is reason enough to jump up and down with joy. Now I won't bother you any further and give you the recipe of these cookies that can conjure up rain! In a bowl, combine flour, butter, honey, ground almonds, egg, orange zest and spices and mix well. Keep dough in the fridge for 1 hour. In the meantime, heat the milk and dissolve saffron threads in it. Finely chop the pistachios and the candied orange peel. Combine saffron in milk, pistachios, orange peel, sesame seeds, honey and butter in bowl until it resembles a rough paste. Roll out the dough until about 1/4 of an inch (1/2cm) thick and cut cookies with a cookie cutter. 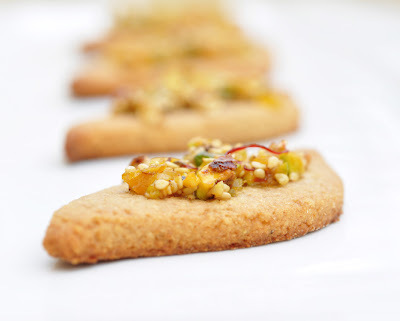 Place them on the baking sheet and spread about half a teaspoon of the pistachio orange sesame mixture on it. Bake for 15 minutes. Let cool completely and store in airtight container.